Getting traffic to your store, but no conversions? HumCommerce is a CRO tool that helps you analyse the behaviour of your ecommerce store visitors and boost conversions. How HumCommerce Helps Boost Ecommerce Sales? Identify the exact pages in your ecommerce funnel where visitors are dropping off. Identify the reasons why prospective buyers are leaving your ecommerce store. Identify the best possible solution to prevent shoppers from leaving your store. From tracking where your ecommerce funnels are leaking to understanding how site visitors behave on your store, HumCommerce has all the necessary features to grow your online store. Are people leaving your store without buying? Find bottlenecks in your store’s checkout funnel and optimise the flow to drive more sales. Not enough people clicking ‘Buy Now’ or ‘Add to Cart’? 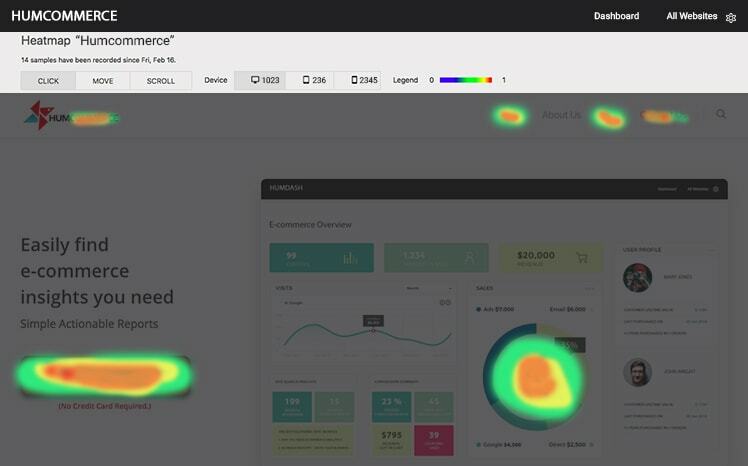 Find out how people interact with your store’s pages using click, move, and scroll heat maps. See video recordings of how visitors interact with your store. Get inside their head to understand their confusions, frustrations and hesitations to improve store checkouts. Easily set up and test variations of product, cart and checkout pages. Find winners that convert that drive more sales. See how your individual store products perform. Measure their performance based on the revenue, conversion rate, and other parameters. Are your store's visitors going where you want them to go? See how visitors navigate your store. Optimise user flow using visual reports. Visitors dropping off your checkout page form? Analyse & optimise forms on your store to understand how visitors interact with them. HumCommerce is a CRO tool that helps you improve your ecommerce stores checkout rates by analysing the behaviour of your store visitors to improve the checkout process and boost sales. Normally $499. Limited time offer.